What we know at CSU Channel Islands as Teaching & Learning Innovations is a new and growing entity. The growth of this program has come about due to the core belief at CI that, we are here to support student learning, and that teaching and teachers matter. Our original goals were often vague and lofty with a strong underlying message: we needed to build more capacity for online and blended learning without losing the personal touch that had become central to learning at CI. Our timeline goes back to 2009 when Michael Berman presented a vision for online learning to the President’s Cabinet. In this vision, he provided a framework we could use to grow a cutting-edge program. From this point forward there has been a slow and steady effort to provide support and resources towards innovative teaching practices. In 2011, this effort officially began with a Teaching & Learning with Technology Initiative and the appointment of an Interim Faculty Coordinator. This was a turning point on campus. We offered our first faculty development focused course redesign program and we began the difficult conversation about changing teaching practices to improve student learning through the use of technology. Since this time, we have passed two Senate Resolutions, prepared 100+ faculty to teach online and blended, opened the Faculty Innovations in Teaching studio, and developed countless resources and opportunities for faculty. The timeline below provides more details about our history and accomplishments. To focus the efforts of T&L Innovations, we have consistently engaged in the national conversation about the future of higher education and educational technology. Having our eye on the trends, and being involved in the national conversations, has allowed us to guide the growth of our team and development of programs to identify efforts that can impact our campus community and keep us moving forward. To this end, we are actively adding to the national dialogue about the future of higher education through conference presentations, blogs, Twitter and formal publishing avenues. These efforts were recently acknowledged by the Online Learning Consortium at the 2016 Innovate conference. Our team and Michael Berman’s leadership were highlighted as innovators to follow. In keeping current, our team looks to many sources for guidance, but a few stand out as exemplars. Particularly useful is the Educause Learning Initiatives’s report on Key Trends in Teaching and Learning 2016. This report is developed based on a “survey of the higher education community to determine key issues and opportunities in post-secondary teaching and learning” (ELI, 2016). Based on this survey, the following issues were identified as pressing issues for teaching and learning in higher education. (Academic Transformation, Faculty Development, Assessment of Learning, Online and Blended Learning, Learning Analytics, Learning Space Design, Accessibility & Universal Design for Learning, Open Educational Resources & Content, Working with Emerging Technology, Next Gen Digital Learning Environments (NGDLE) & Services, and Digital & Informational Literacies). We also closely follow the New Media Consortium’s Horizon Report. Both Michael Berman and Michelle Pacansky-Brock have participated as advisors to the Horizon Report. The Horizon Report examines what is on the horizon for the next five years for higher education institutions with regards to technology. The Horizon Report examines 18 topics in three categories, Developments in Technology, Trends and Challenges. Our CI Keys project was recognized this year in the report as an example for the “Solvable Challenge” Improving Digital Literacy. These two sources, ELI Key Trends and Horizon Report closely align to the current efforts of Teaching & Learning Innovations at CI. Specifically, we have focused in on Online/Blended Learning, Faculty Development and NGDLE. A few exemplars of how we are addressing these issues include: our Pathways model for Faculty Development, tracking growth and quality in online and blended courses, and our CI Keys projects as NGDLE. Our Pathways model exemplifies our belief that underlying every workshop, training or resource is a teacher that must be valued and students that are here to learn. Our program builds on networks and connections to spread change throughout our community. The Pathways model provides many points of entry and ongoing opportunities for learning and interdisciplinary collaboration. The video below outlines the components of our model. Running alongside our Pathways is a focused effort to have cutting-edge, emerging technologies that support teaching and learning available to our faculty. For example, we have adopted VoiceThread, a tool that allows for asynchronous voice and video conversations in the online environment. This tool is a key to creating humanized and connected learning when moving out of the traditional learning environment. We have also integrated Zoom, Portfolium and TopHat into the repertoire of tools adopted and supported at CI. Each of these tools has the power to enhance interactions and connections. 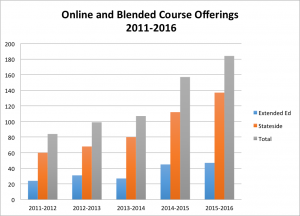 As a result of 5 years of building capacity in our campus community, online and blended learning at CI has grown substantially. We have moved from a campus with a few disconnected online courses to a campus with opportunities for students to learn in many modalities. Our current online and blended offerings exist across many of our stateside programs and through Extended Ed. These courses are being developed to meet the needs of our students while maintaining a focus on the importance of the faculty-student and student-student interactions and presence. Exemplars can be found in Spanish, Special Education and English. Looking to the Next Generation Learning Environments, CI is fortunate to be the only CSU that is part of the Domains movement currently sweeping through higher education. In 2013 we began implementation of CI Keys. CI Keys provides all faculty and staff with the ability to create and mange their own domain. CI Keys users have access to powerful open source Internet tools that allow them to create online portfolios, exhibits, online journals and magazines, wikis, FAQs, and many other kinds of digital resources and publications for use in courses, the co-curriculum or wherever and however else they choose. This effort has opened up the possibilities for faculty beyond the walls of our Learning Management System (LMS) and helped us lead the effort towards digital literacy. We captured the voices of a few faculty enjoying the benefits of CI Keys. Although we are busy, there are is still work to be done. In the coming year, we aim to maintain our current programs while we continue to develop capacity for growth in online and blended learning. We also intend to build a program for the campus Affordable Learning Initiative focused on Open Educational Resources (OERs) with the goal of reducing textbook costs and improving the quality of educational materials available to our student body. Lastly, we will be integrating a Faculty Development Coordinator into our team to build a structure for supporting faculty in their scholarship and creative activities, while keeping the efforts of T&L Innovations closely aligned to the needs of the campus and faculty. To make all of this happen we look forward to ongoing cross-divisional support from Academic Affairs and Technology & Communications. The unique structure of our team, crossing two divisions, allows for an a broad perspective on the needs of the campus, eases communication and removes barriers to implementation.